The aim of RYLA (Rotary Youth Leadership Awards) is to foster the leadership capabilities of young people, encourage leadership of youth by youth to serve in the community to create a better world. Academic: This is the entrance ticket to seek for "ideal jobs" and "guaranteed incomes". Abilities: You can only stand out in society provided that you have outstanding talents and abilities. Achievements: Your life becomes satisfied if you have obtained certain achievements in life. 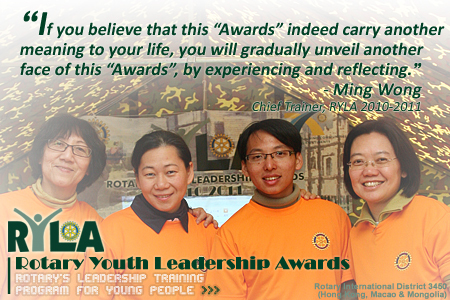 For many young people joining a RYLA program, they may think that the true value of the "Awards" is providing a chance for them to build up their outer achievements in their lives. In RYLA 2011, if you have the thought of achieving any of the above mentioned, you can still be able to get what you are looking for, as it is completely your own decision. Appreciation: Appreciate what you already have, and understand that only appreciations generate the power of creation. Attitude: Discover your true self, and realize how you treat your life. Awareness: Aware the causes and effects of your behaviors, and understand your life mission. By reflecting on your own experience, your awareness can be raised. When your awareness is raised, you will be easier to realize your attitude, your way of treating yourself, and your life mission. Then your awareness will lead you to discover the power of creation, which the power guides you to reach completeness in life, and in the outer environment it enables you to lift up your abilities. Therefore, RYLA 2011 is actually a self discovery journey. We invite you to join this journey. Whenever you start the journey, you will discover more and more.